It looks like Toyota is still dedicated to build real off-roaders. 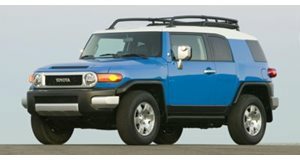 When Toyota previewed its new FT-4X Concept with 18-inch off-road Goodyear tires, we immediately saw it as the potential revival of the beloved FJ Cruiser. Now Toyota has revealed the FT-4X in full at the 2017 New York Auto Show. FT-4X stands for "Future Toyota-Four-wheel-drive Crossover," and it is aimed right at off-road enthusiasts. If it was put into production, the FT-4X would likely sit below other off-road-focused Toyota models like the 4Runner and Land Cruiser. Like the old FJ, this new concept has some unique features. The exterior is clearly styled to have a rugged appearance not unlike the Jeep Wrangler. The rear hatch is called the "Multi-Hatch" because it opens both upwards and sideways for dual functionality. The FT-4X also has tow hooks in the bumpers, tie down points in the roof rack and power supply points for exterior lights. All of these features add to the concept's off-road and camping prowess. There are also plenty of callbacks to past Toyota models such as a window on the driver-side fender that pays homage to the Xtracab from Back to the Future. This window is also removable much like on the original 4Runner and the Toyota badge has even been replaced by the old bold Toyota name spelled out. The interior is also meant to be extremely functional. The rear hatch has two storage areas, one that keeps things cold and another that keeps them hot. We doubt that this would make it to production, but the flat load floor with sliding rails would be a nice production feature. To add even more functionality for camping, the interior lights can be removed and used as flashlights and the rear door handles can be used as water bottles. The concept is full of fun features like this including: a North Face sleeping bag that doubles as an armrest, a removable radio that can be used as a portable stereo, and front air vents that rotate to dry off gear in a lower storage area. Toyota has been very clever with this concept, even forgoing a navigation system. Toyota realizes that most people use their phones to navigate, so it just put a phone mount in the dashboard. All of these awesome features are outlined in Toyota's press video that depicts the car on a camping trip. Since this is just a concept, it does not have an engine. However, Toyota says that it would potentially have a small four-cylinder engine that would send power to a mechanical four-wheel-drive system. It would even get a selectable low-range mode for some extreme off-roading. There is no word on whether the FT-4X will make production, but Toyota has certainly put in a lot of work to make it cool.